I am very excited about today’s real party! It comes to us from the talented mom, sewer, crafter, and designer, Jessica Levitt. You may remember Jessica from the Construction Birthday Party we featured back in December, which was amazingly cute. Well today I’m thrilled to share the fantastic party she threw for her daughter’s 5th birthday. 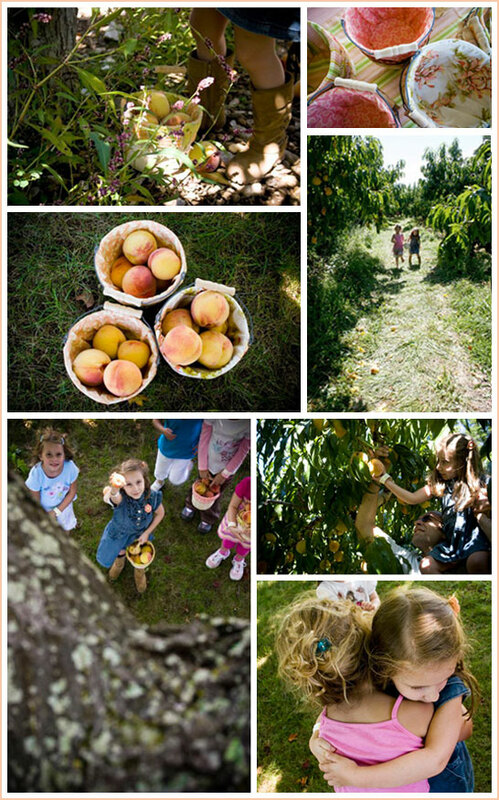 Put together the charming peach farm location and her daughter’s love of ice cream… you’ve got yourself some peach picking and ice cream licking fun. 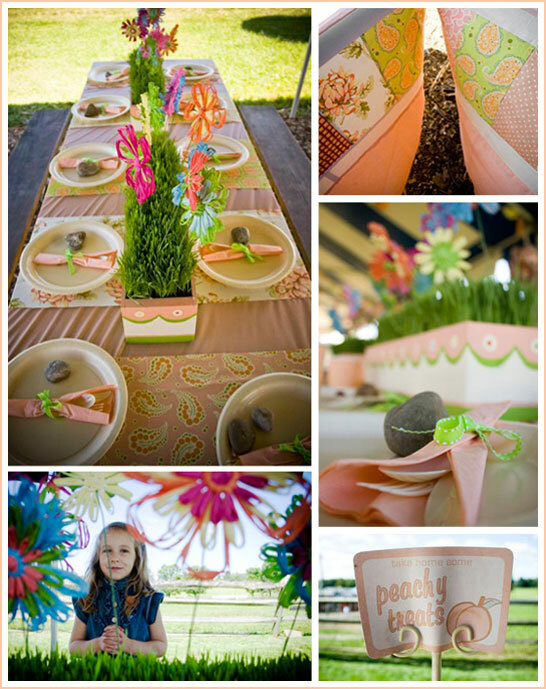 Let’s take a look at this Peaches and Cream Birthday Party! 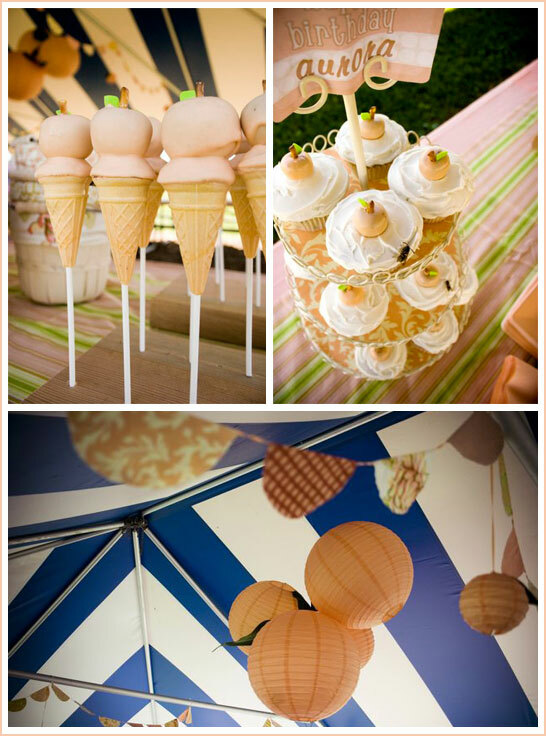 I LOVE these super cute peach cupcakes and peach ice cream cone cake pops. Very Bakerella-esk. “I’m happy to report that we were blessed with gorgeous, sunny (if somewhat windy) weather. That’s the totally stressful part of planning an outdoor party away from home. I had all of 1 1/2 hours to decorate the tent. Not pretty. Thankfully I had some helpful family around. 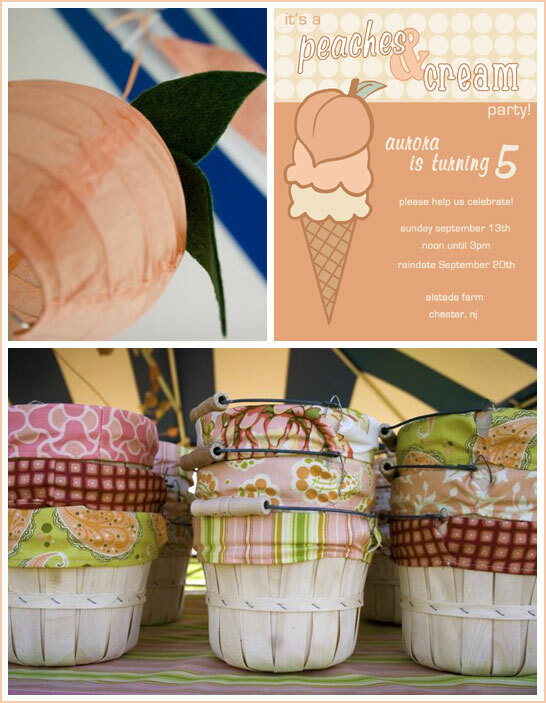 The tent had giant peach paper lanterns strung up with felt leaves. I also made some fabric garlands that ran across the support bars with mini peach lanterns hanging down. Totally didn’t anticipate the amount of wind so it was hard to get a decent picture, by my friend Christianne did it again. Once again, Jessica amazes me with her attention to detail and design skills! The mix of peach fabrics creates a charming patchwork-y feel, perfect for down on the farm. A special thanks to Christianne Ebel for the stunning photography and Jessica Levitt for the charming party inspiration. Get the full scoop on all of the adorable peachy details on Jessica’s blog. Oh, I love this theme. All of the peach fabrics is fun! I love this! The fabric pickign baskets are adorable and cute little gifts to go as well. Great photography as well. Wow, this party is making me crave warm weather and peaches. Beautifully done! Oh my! This is such a sweet party. What a lucky birthday girl to have such a talented mom. Great job Jessica! What a cute idea! I love the theme, and those peach laterns? perfect! I LOVE the ice cream cone cakes – could I possibly get the recipe/instructions?